C.J. 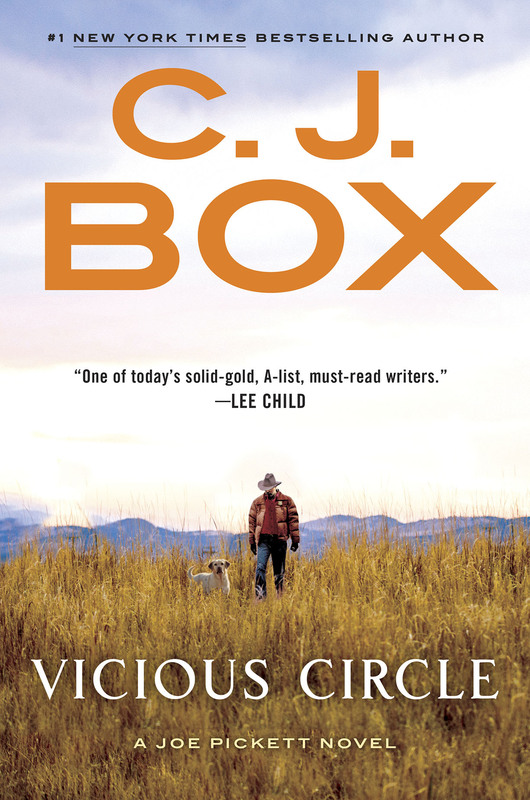 Box, the New York Times bestselling author of sixteen Joe Pickett novels, has millions of fans. In addition to the Joe Pickett series, he’s written five standalones, and a short story collection, Shots Fired. He’s won multiple awards for his fiction. His books have been translated into twenty-seven languages. He lives in Wyoming. 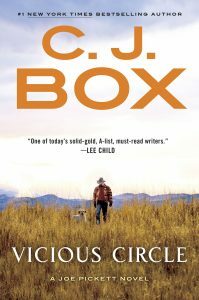 Vicious Circle, the 17th novel featuring Wyoming game warden Joe Pickett, returns to the storyline begun two novels ago in Endangered. Joe and his family must deal with a vindictive ex-con killer, Dallas Cates, who returns to town seeking revenge against Joe and his family. Though Joe and his family are at grave risk, Joe is hamstrung by the law and there’s isn’t anything he can do without proof Dallas Cates is out to satisfy his bloodlust. 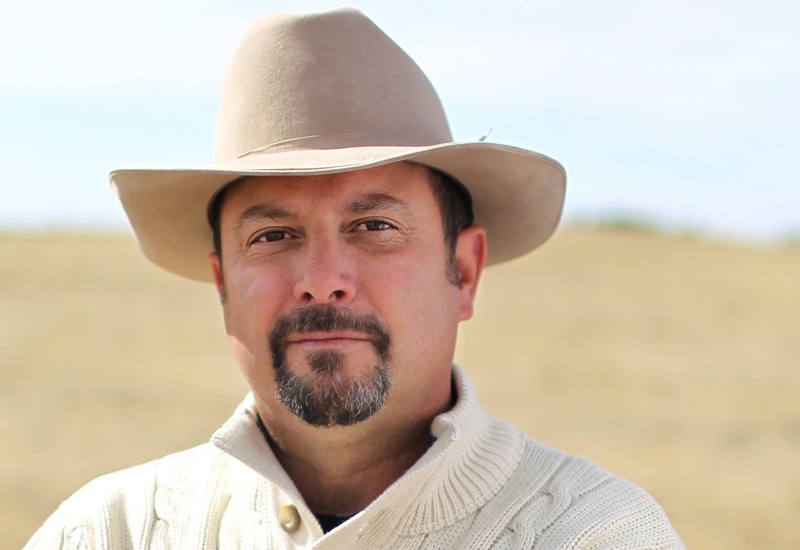 Joe Pickett is unlike many contemporary thriller protagonists. He’s happily married; is a good father; doesn’t have a dark past; works hard; and is very honest. What do you feel makes him such a beloved fictional character? I think it’s because he’s real and he’s also flawed. Therefore, the reader has empathy for him. The reader knows he can screw thi ngs up and something bad can happen to him and his family. I hope it draws the reader in more because it’s easy to see one’s self in his situation. A reader can easily identify with Joe. Nate Romanowski appears in Vicious Circle. He’s a fascinating character. Will you tell us a little about him? Nate was introduced in the third Joe Pickett novel, Winter Kill. He’s a master falconer with a Special Forces background. He has a complicated past and present. His relationship with Joe has gone from one end to the other. Nate has been around through most of the books. He has a code of his own and has gotten in big trouble at various times. Recently, all federal charges against him were dropped. He’s trying to go straight. He’s really at his best when he has an enemy against whom he can take action. Vicious Circle has various thematic elements, one of them being revenge for perceived wrongs. Will you talk about this as a classic western theme? I think revenge is one of the three or four classic western themes. The bad guy comes back to town and the good guy must stand up to him. I think it’s more nuanced than that in this book. Joe has some empathy toward Dallas Cates, the bad guy who’s coming back. Joe feels that as a law enforcement officer, he participated in over-charging the man and feels he did it in a way that wasn’t completely ethical. Joe is willing to drop the feud if Dallas will just stop in his quest. How would you characterize the Joe Pickett novels? Are they thrillers, westerns, or both? I think they’re both. I like to think of them as contemporary westerns. There are mystery elements, thriller elements, but mainly they’re adventurous tales. I don’t sit down and wonder if I’m going to write a mystery or a thriller. Almost all the books are westerns to some degree. I recall talking to George Pelecanos, whose books are mostly set in the mean streets of Baltimore. He considers his books to be westerns. The prose in Vicious Circle is elegant, yet straightforward and easily readable. How would you describe your writing style? I try not to show off. I want to simply communicate as effectively as I can to tell a story. I think that comes from my background as a journalist and from what I enjoy reading. I pare things back. If I write a purple prose paragraph describing scenery, I’ll go back and try to cut it down to its essence so the reader gets a good sense of what it looks and smells like, but doesn’t go on and on. Speaking of what you enjoy reading, who are your literary influences? My favorite author of all times is Thomas McGuane. I also enjoy reading books by Jim Harrison. I’m a big fan of Cormac McCarthy. They all write contemporary westerns in a straightforward style. And they all have a great sense of place. Other than Joe himself, which character in Vicious Circle was most compelling to write? Some of the secondary characters were a lot of fun to write. Randall Luthi, an ex-con recruited to help Dallas go after the Pickett family was complicated and interesting. I also found Wanda Stacy to be complicated, especially since she gets caught up in the action through no fault of her own. Another fun character to write was Dave Farkus. I do a lot of research. It’s sometimes my favorite part of the writing process. I then construct an outline based on the research. Then, I try to pull the reader through the research in a page-turning way. Do you have a strategy for overcoming writer’s block? I can’t say I’ve ever had it. I’ve had periods where I’m so busy doing things that I can’t find large blocks of time in which to write. When I feel a little stymied, I don’t have a problem. I write an outline and know where the story is going. Even on days when I don’t necessarily feel like writing, I still put words down on the page and can go back and fill it in later. What’s coming next from C.J. Box? Every other year I write a standalone. This year, Paradise Valley will come out. It’s the conclusion of what’s being called the Highway Quartet, the others being The Highway, Back of Beyond, and Badlands. That’s coming out in July. Congratulations on writing Vicious Circle, another in the Joe Pickett series which Publishers Weekly described as “the most suspenseful in this world-class series, setting a new standard for C.J. Box.” I found it suspenseful and could easily relate to all the characters in the novel. He has written the Natchez Burning Trilogy featuring Penn Cage. The first two novels are Natchez Burning and The Bone Tree. 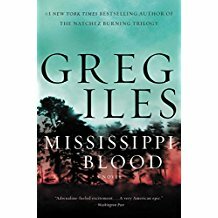 Mississippi Blood is the last volume in the trilogy. In it, we find mayor and former prosecutor, Penn Cage who is shattered by grief at the loss of his fiancée Caitlin Masters. In addition, his father, Dr. Tom Cage, is about to be tried for murder. Dr. Cage’s trial sets an ominous clock in motion, and unless Penn can lift the veil of the past and help exonerate his father, his family will be destroyed. Mississippi Blood features a mesmerizing murder trial at the heart of the novel. How did you learn so much about courtroom procedures and tactics? I’m not an attorney and don’t have any formal knowledge of courtroom procedures. I’ve attended a few murder trials but most of what I learned about trial tactics and routines can be attributed to my attorney-buddy who read the first draft and made many corrections. My guides for writing convincing trial scenes came from my having read Robert Traver’s Anatomy of a Murder and Scott Turow’s Presumed Innocent. Those books gave me plenty of information. As you know, an actual trial is a drama acted out in real life. For a novelist writing a trial scene, the trick is to eliminate all the tedious elements found in an actual trial, while retaining the very essence of “conflict” which is at the crux of every trial. 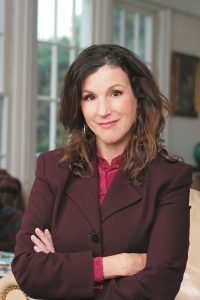 That conflict of competing narratives between prosecution and defense is the dramatic force, whether in an actual courtroom trial or one within the pages of a book. If your narrative is convincing, your trial tactics will work, whether to a jury or to the readers of your novel. Penn Cage is a fascinating character. How has he evolved over the course of the trilogy? It was never my intention for Penn to be a series’ character. 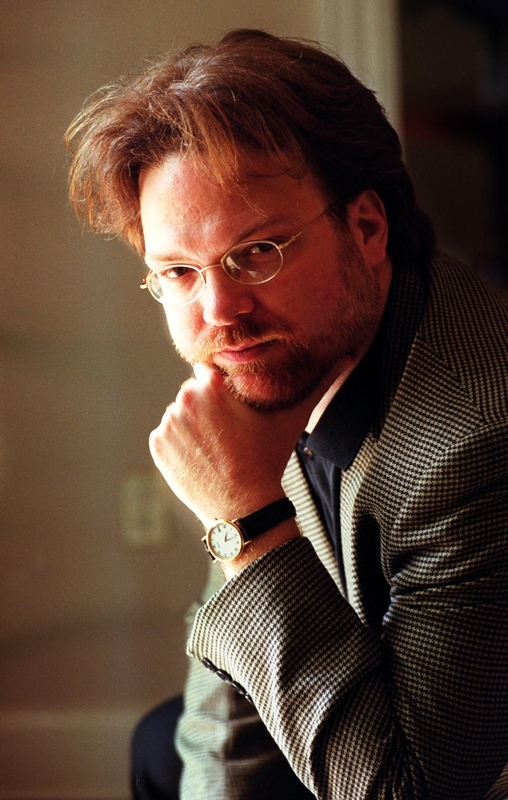 I thought his story would be explored in a standalone novel, but as I returned to Mississippi more and more in my fiction, Penn evolved from being an observer to an actor in the drama of the novels. His evolution involved his becoming more and more morally challenged with each book, which forced him to compromise with his own values as he went forward. As with us all, the more we see of life and surmount challenges, we must make certain compromises. When writing the Natchez Burning Trilogy, how did you handle giving enough backstory in each successive novel without repeating too much of the contents of the earlier books? It’s a temptation to make the worst mistake possible by providing exposition for the reader who came late to the trilogy. I had to trust that a new reader could be dropped into this story in medias res, and I felt the power of the story would clutch the reader through to the end. I avoided giving too much backstory beyond just using a few compressing devices early in the book—a newspaper summary—which I felt would suffice. I had to trust the story would carry itself. I understand in 2011, you sustained life-threatening injuries in an automobile accident, and found new motivation by re-entering the world of Penn Cage, the realm of Natchez, and the secrets of the town. Will you tell us a bit about that? I was driving when a car going seventy miles an hour, hit my driver’s side door. I sustained a torn aorta, many broken bones, and lost half my right leg. I was in a medically-induced coma for a week. When I came out of that situation missing a leg, my entire attitude toward writing changed. I realized I’d been compromising with myself. What I mean is this: I originally conceived of the Natchez Burning story as one book, which I was on the verge of completing when the accident occurred. But I had been shortchanging myself because I couldn’t properly address important issues such as race, family, and the South in a single novel. When I came out of that coma, I realized I didn’t care how long the story had to be. I no longer cared who would get angry at me; and I told myself if I was going to be a Southern writer, I had to be unflinching in my commitment to the truth. It didn’t matter what the consequences might be. The accident altered my life. I undertook a quest to write what I felt I needed to write. I decided to write a trilogy instead of writing this story in one book. I lost my publisher and changed agents. I had no idea how it would turn out. There are very few trilogies in mainstream trade publishing. Generally, it’s considered commercial suicide. The accident took me from being perceived as a thriller writer to being seen as a fiction writer dealing with very serious issues. And I’m gratified to have made that transition. Speaking of Southern writers, your writing has been compared to that of Pat Conroy, Thomas Wolfe, and William Faulkner. How would you describe your style? I would not compare myself with those writers. Like so many of us, I was inspired by them. I was fortunate enough to meet Pat Conroy a year before he died. I also got to meet William Styron and James Dickey. I recall something Faulkner said: We look at our heroes and on the deepest level, we’re trying to be them. I would never presume to compare myself with those writers. But, I look at the place and time when they were writing and the subjects they chose, and I jumped into the water in my time. I feel I’ve got to do the best I can. What separates me from them is I’m a commercial novelist. I have to make a living. Even though I write what I want to, I still have to sell enough books so the publishing industry will pay me. That’s a difficult compromise to make. Throughout my career, I have had to make that compromise to a greater or lesser degree. With this trilogy, I’ve compromised to the least degree possible. The writers you mentioned were commercial novelists, but while writing, they threw commercial interests to the wind, much more than I can. We both know this as writers: when writing a novel, we’re looking for resonance. I feel resonance is achieved by providing the reader with emotional insight that’s only gained through suffering. In a good commercial novel, we find two or three such insights in the book. What separates a good commercial novelist from a Faulkner or Tolstoy is this: those great novels have profound insights on almost every page or chapter. They distill the human condition in ways most commercial novels never can. I understand Sony Pictures is developing a cable television series based on the Natchez Burning Trilogy. Tell us about that. It’s in development right now, but these things take a very long time. So, I’m just waiting to see what happens. I’ll tell you something I learned as a musician and it applies to being a writer, as well: no matter how much you love something, when you begin doing it for a living, it changes things. In a way, the thing you love doing the most is inevitably compromised. What do I love about the writing life? I love the freedom of it. If you’re fortunate enough to make a living from writing, you probably have more freedom than in almost any other career. When you get over that initial hump of attaining success, you have a great deal of freedom. You’re on your own. That’s what I love. You’re having a dinner party and can invite any five guests, living or dead, from any walk of life. Who would they be? That’s a great question. I really have to think about it. [Reflection for a while] I’d love to invite Carl Jung along with Robert Oppenheimer to hear them discuss science and psychology. It would be fascinating to have Friedrich Nietzsche there, along with the great Greek playwright, Euripides. They could add a great deal of insight about what it means to be human. And I think Marie Curie would add to the mix. Can you imagine the conversation these five people would have? Congratulations on penning Mississippi Blood. It’s an atmospheric, beautifully crafted conclusion to a trilogy exploring racism, abuse of power, and the meaning of justice. It blends imagination, suspense, history and lyrical writing in a novel that I could not put down until I’d read the very last page. Arnold Newman, with a Ph.D. in conservation biology, is the Founder and Executive Director of the International Society for the Preservation of the Tropical Rainforest. For over five decades, he has been an advisor to 80 countries in which tropical rainforests are located, and this work has taken him to all continents where these forests exist. 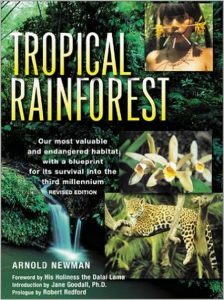 His book Tropical Rainforests is viewed world over as the lead book on our endangered habitat and its survival for the Third Mi llennium. It is very likely one of the most important books published in our time. As described in the book, what is a tropical rainforest? A tropical rainforest is a place in which a consortium of material and climate come together in a perfect combination of temperature and rainfall. The botany takes care of the rest. There must be at least 80 inches of rainfall per year for the environment to form a tropical rainforest, the most life-giving environment on our planet. As we cut and denude tropical rainforests, there is less evapo-transpiration coming from the leaves, which is responsible for the rainfall nourishing the rest of the mass of the trees and the undergrowth. Ten years of investigations by climatologists have discovered there is less rain falling on Amazonia, which has led to the environment drying out, causing devastating results. What about our tropical rainforests makes them so important to our planet? Let me name some of the products that come out of the tropical rainforests. Just look at our breakfast cereals. Rice Krispies come f rom Asian forests; corn flakes come from harvests in South America. Enormous amounts of sugar come from Indian rainforests. Pineapples come largely from Venezuelan rainforests. Hash brown potatoes don’t come from Ireland, but are derived from Andean rainforests. Much of our orange juice comes from Asian forests; tomato juice from Central America; cocoa—not from Switzerland—but from Latin American rainforests. Coffee and tea are grown in Asian and Ethiopian forests. The origin of our beef cattle owes a great deal to the benteng bull, originally found in the Java rainforest. We’ve analyzed only one percent of tropical plants for possible use in medicines. Fifty percent of commonly used medications are derived from plants, and twenty-five percent of prescription drugs are derived from tropical rainforests. The National Cancer Institute recognizes that seventy percent of plants with anti-cancer properties grow only in tropical rainforests. We’ve only analyzed one-percent of those tropical plants for possible use of their alkaloids. One plant, the rosy periwinkle, produces seventy-five alkaloids—and only two of them have produced vinblastine and vincristine, chemotherapy drugs which bring about a ninety-nine percent remission in acute lymphocytic leukemia, and a high rate of remission in Hodgkin’s Disease. This single plant, with only those two alkaloids, has given us this incredible benefit. Your book describes some of the threats to our tropical rainforests. Tell us about them. Imagine rivets popping from an airplane in flight. What’s the tipping point when one more rivet pops and a wing falls of during flight? We’re creating climate change by deforestation of the tropical rainforests. Tropical deforestation is responsible for nineteen percent of greenhouse gas emissions. If we could prevent half of that deforestation, we would be cutting back more on our emissions than has been done since the issue of climate change was first discussed. We’ve seen how difficult it is to curtail the use of fossil fuels, but it’s far easier to cut back on the denuding of the tropical rainforests. Currently, we’re very quickly obliterating our tropical rainforests. They’re being decimated because of our planetary birth rate and the consequent demand that places on the use of resources. Humanity gained its one-billionth person in 1835. Presently, we add one billion people every thirteen years. The second factor in the denuding of the tropical rainforests is the massive industrial complex which excavates the riches of these forests. 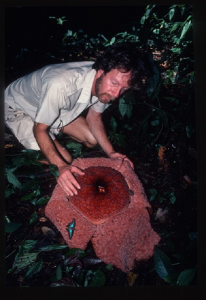 This primarily involves logging for mahogany and other timber species. Every mahogany tree felled causes seven other trees to die. The sun penetrates to the forest floor and weed species flourish, all transforming the forest into something different from what it had been. The logging roads make easy access for peasants who then farm, using slash and burn techniques which further erode the forests. More and more land is used as the ash from the burned forests makes the land usable for only a few years; consequently, the people move on; cut and burn more forests; and the problem widens. Cattle pastures last for six years, but after that use, the land becomes so degraded nothing else will grow. Even with abundant rainfall, the formerly life-giving land remains barren. Palm oil and soy bean production are very lucrative businesses. Enormous amounts of money are made by very few people, who often bribe the ministries of agriculture and forest in tropical rainforest countries in order to be allowed to strip the timber and establish massive plantations. What happens to our planet if we lose more of the rainforests? Climate change is accelerated by tropical rainforest destruction. Deforestation is now causing superstorms, floods, droughts, hurricanes, tornados, cyclones, and glacial melting all over the world. We’re seeing a rising sea level which is wreaking havoc on island nations like Bangladesh. Because of melting of the Himalayan glaciers, lowland villages are being flooded and destroyed. People are migrating to the capital of Dacca, overwhelming the city. Similar migrations are beginning to occur all over the world, and are part of the problem causing the refugee crisis in the Middle East and in Africa, along with civil wars. Rising sea levels will impact everyone on this planet. This not only happens in places like Bangladesh; let’s look at Miami Beach. It sits on fossil coral, which is porous. Even with water breaks to stop the sea from coming in, seawater seeps in under the walls. It’s moving inland to Miami. One day in the not-too-distant future, there’s going to be an enormously wet wake-up call. Your book describes steps we can take to ensure the survival of the rainforests. Tell us about them. Tropical rainforests hold ninety percent of all life forms on earth. It’s our duty to put a stop to their destruction. Each of us is responsible for creating the market for tropical rainforest products. Globally, sixteen million trees are cut each day. If we change the motivation for industries to denude these forests, they’ll find other ways to make their livelihoods. Twenty years ago, I helped Los Angeles pass into law a provision that tropical hardwoods would no longer be purchased for city benches or be used in city facilities. We still have a chance to save the forests and our planet. We must maintain pressure on the government. One letter to a representative elicits a form letter from that representative. Three to five letters or emails, elicit personal responses. If a member of congress recognizes there’s a huge constituency concerned about this issue, there will be legislative pressure put to bear for environmental safeguards. We have to demand action on the local, state and federal levels and we have to change some of the ways we live our lives. Congratulations on writing this important book with its clear explanations, awe-inspiring photographs, and eye-opening diagrams explaining so many issues crucial to our planet’s survival. This book is so important, it has a Foreword written by the Dalai Lama, and an Introduction by Jane Goodall. Brad Parks, a former newspaper reporter, is the only author to have won the Shamus, Nero, and Lefty Awards, three of crime fiction’s most prestigious prizes. Say Nothing is his 7th novel. 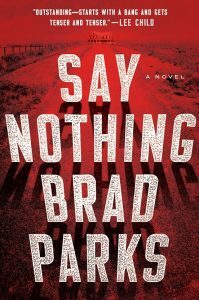 Say Nothing features Scott Sampson, a federal judge who’s held in great esteem. He has a lovely wife and two great kids. One morning, Scott and his wife, Alison, discover that their six-year-old twins have been kidnapped. Scott receives a call warning him to decide exactly as he’s told in a drug case he’s about to rule on. If he doesn’t follow these instructions, his children, Sam and Emma will suffer the consequences. He is told not to call the police, or anyone else. He’s told the Say Nothing. But the call is only the beginning of a terrible ordeal. The first case is only a test run. It becomes clear, the kidnappers want to influence the outcome of the most high-profile trial of Judge Scott Sampson’s career. The ensuing events are harrowing. When we last talked, you told me the newsroom has given you enough material for twenty novels. How did the idea for Say Nothing come to you? I owe my friend Steve Hamilton a debt of gratitude. He gave me some advice years ago. He said, ‘You have to write the book that scares you.’ Ever since then I’ve ruminated about that. One day while I was jogging, I asked myself, What scares me? I’m the father of two elementary school-age kids. Nothing scares me more than the thought of something happening to them—like a kidnapping. I asked myself, ‘Who would want to kidnap my kids?’ From a storytelling standpoint, a ransom demand would be boring. I began considering what kind of character might have something to offer a kidnapper that could not be gotten any other way. And then it came to me: a federal judge might be a good target because he could not be bribed. He’s a moral paragon and the only way to influence him would be to have control of his children. He would then be forced to do the kidnappers’ bidding. In Say Nothing, Scott Sampson is faced with ethical dilemmas of momentous proportions. Talk to us about the role of conflicting ethical decisions in your thrillers. Conflict is paramount in many novels, especially in thrillers. However, in Say Nothing, there’s really no decision for Scott Sampson to make. Nothing matters to him but his children. His future, his financial situation, his reputation and his job are all secondary to the wellbeing of his kids. He really has no choice and it’s interesting to see how the decision he must make impacts him in the larger sense. He makes the decision he must, and the question becomes, what will it cost him? As the novel continues, it costs him more and more. Yet, he’s still willing to put everything on the line. He began the book with an ideal life: he has a wonderful job, a lovely wife and healthy children. He has everything a person could want. And then, slowly but surely, every one of those things is taken away. 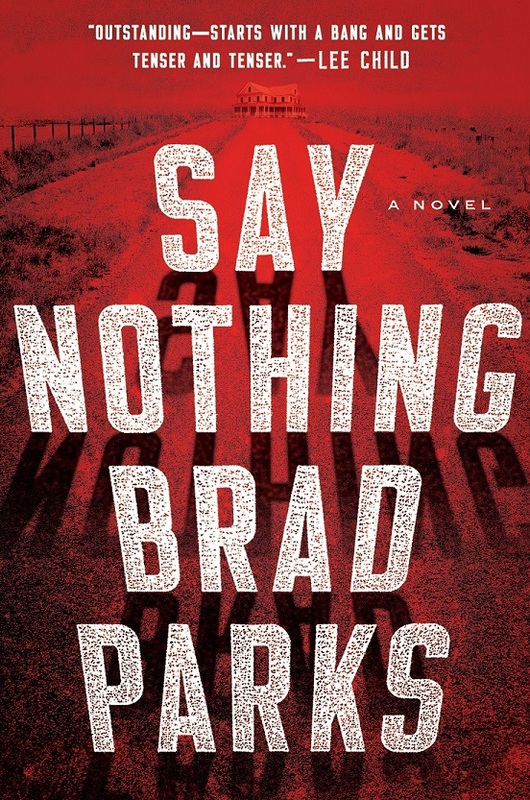 Say Nothing has been described as a ‘Domestic thriller.’ Define that for our readers. Different people might have slightly different definitions of a domestic thriller. To me, it’s a thriller in which the protagonist is someone you could meet at the grocery store. It doesn’t involve a superhero with Special Forces training. Rather, it concerns an Everyman or Everywoman. That’s always appealed to me because that kind of character is easy to relate to. I’ve read a few of your novels. Among other things, they all involve the importance of family. Will you talk about that in relation to the novel? As a writer, I need an emotional entrée to a book. If I care deeply about the characters and what’s happening to them, I’ll be able to make the reader care, as well. The notion of family resonates with me and with many other people. I could not have written this book when I was single and not yet a parent. Being a husband and parent gave me the insight to be able to write this novel. I’m always writing from a place of personal knowledge. When you get rid of all the trappings of your life, what really matters above all else is family. Many thrillers involve either a missing person or a kidnapping. These issues seem to hold a special attraction for so many readers. Will you talk about that? It goes to the heart of the definition of a thriller. Of course, a mystery is about solving a crime, while a thriller is about preventing one. The threat of something awful happening—like someone going missing or being kidnapped—is something we writers use in our writing. The threat must be real to the reader. For instance, I’m afraid of spiders. I was once sitting in my office and a huge spider appeared on the wall. It was nearly as large as my hand. I tried to kill it with a rolled-up newspaper. But this creature was so huge, it laughed off my feeble attempt and disappeared. So, I was left with this massive spider lurking somewhere in my office. And then, I suddenly felt something tickle my leg. I jumped and screamed. I think thrillers must have something like that spider at their core. So, I’m always looking for that spider. You mentioned writing from some well of personal knowledge. You’re neither an attorney nor a physician. Yet, Say Nothing involves easily understandable and vivid descriptions of the federal court system and certain aspects of medicine. Tell us a bit about your research for this novel. As a newspaper reporter, I was no stranger to courtrooms. The law has always fascinated me. For this book, I shadowed a federal judge for a while and learned a great deal about the federal system and the law. I could never have written about Scott Sampson without that access. The dialogue in Say Nothing is very realistic and highly believable. Tell us about your process for writing dialogue. It helps that I was a newspaper reporter. I spent years listening to people talk. I learned to listen carefully and to distill the essence of what people were saying. I always looked for quotable moments. When writing, I read my dialogue out loud. I ask myself, is this how someone would talk? It it doesn’t sound realistic to me, I re-do it. What’s surprised is that I’ve learned that some of my greatest enjoyment comes from being read by other people. I love getting reader emails such as, you wrote this character…do you know my Aunt Betty? That kind of feedback tells me the reader has internalized my story and fleshed out the character even beyond my own imagination. That shared experience is wonderful and I enjoy that kind of magic. You’re having a dinner party and can invite any five people, living or dead, real or fictional, from any walk of life. Who would they be? I’d invite Harper Lee, Thomas Jefferson, Mark Twain, and we might as well have Jesus at dinner. He might have some answers to questions we all have. [Laughter] Then, to balance it out, I’d invite Mohammed. What would you all be talking about. I think we’d find universal themes to talk about. We’d realize issues that drove people in Jesus’s time were the same things Mark Twain wrote about and Thomas Jefferson wrestled with when he wrote the Bill of Rights. And those same things still drive us today. So I think the conversation would be about timeless issues of the human condition. What’s coming next from Brad Parks? Another standalone for which I don’t yet have a title. It concerns family again. [Laughter] It’s about a woman whose child is taken from her by Social Services. Someone is framing her as a criminal in order to take away her child. Congratulations on writing Say Nothing, a propulsive, harrowing, and deeply moving novel that kept me turning pages because I had to find out what would happen to this extraordinary family. Faye Kellerman is the bestselling author of 30 previous novels, most of them featuring the husband and wife team of Peter Decker and Rina Lazarus. Faye and her husband, Jonathan Kellerman, are the only married couple ever to appear on the New York Times bestseller list simultaneously for two different novels. And both are authors very long-running series. 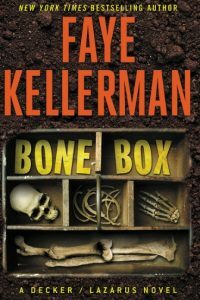 Bone Box, the 28th installment of the Decker/Lazarus series, begins with Rina making a shocking discovery of bones found in the woods of her upstate New York community. It leads her husband, police detective Peter Decker, to investigate a series of gruesome unsolved murders which point to a diabolical serial killer who’s been hiding in plain sight. And whoever this psychopath is, he may be on the hunt for a fresh victim. 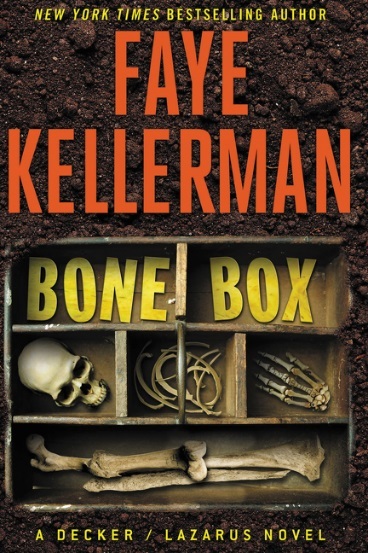 It’s clear from reading Bone Box that you know a good deal about forensic science. How did you learn so much? As you know from our last talk, in my early years, I was trained as a dentist. We studied gross anatomy, which is where I got the title Bone Box. Dental students have a different experience from medical students: while medical students are given the entire body in gross anatomy, we are given parts of the body in a bone box. This is how we dentists begin learning the anatomy of the body, especially the head and neck. As for forensic science, I ran with my basic knowledge of anatomy and medical science and talked to a few experts. I also went online—an easy and wonderful way to do research these days—and found all the forensic information I needed for the story. Of course, over the years there have been advances in forensic science’s ability to make determinations about a very decomposed body, and all that research was available online. So, I used my basic knowledge and updated it by reading articles. What do you feel makes Peter Decker and Rina Lazarus so appealing to the reading public? I think they’re appealing because they’re full, fleshed-out characters. I like that Peter is a great family man and is passionate about his work. To him, solving each crime becomes a personal mission. I like characters who care about what they’re doing and who are concerned about the victims. I think readers also like that. I think Rena and Peter have a very good marriage, but it’s a realistic one. Sometimes they fight and I think lots of people can identify with that. She’s also a good homemaker and enjoys cooking her kugel and brisket, but contributes to Peter’s investigations whenever she feels it’s necessary to join in. Part of why I moved them to a small town and away from Los Angeles was to allow Rena to play a larger role in the investigations. With the L.A.P.D., there was no way she could have access to the material Peter shares with her now. The L.A.P.D. is a huge, monolithic bureaucracy, but in a small town, there are fewer resources, so she can become involved. In Bone Box, Peter Decker’s interrogation tactics are quite impressive. 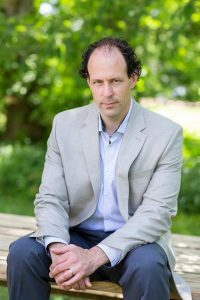 Have you studied interrogation techniques? In my books, Peter and the interviewee simply talk. If you get a person talking, he or she will tell you all sorts of things. I think to be a good interrogator, you must be a very good listener. If you get guilty people talking, they will inevitably come out with a contradiction to a lie they’ve told. A good interrogator must engage in active listening, and that’s what Peter does. Do you ever brainstorm with Jonathan for plot ideas or twists? We don’t really brainstorm. I’ll come up with the root of an idea and I might mention it to him. Sometimes I show him a finished book. Many times, I give him the first fifty pages and ask him what he thinks. I tend to do a lot of walking to stimulate my imagination. I love to walk and think about what might make an interesting story that will provide readers with a few hours of entertainment and relaxation. Which question do you get asked more often than any other? The thing is, I never know what’s going to become an integral part of a novel, but it all derives from some part of my life experience or imagination. I write well-fleshed out characters, and—you know this better than I do—inevitably, more ideas spring from my subconscious. They all have a little bit of me in them. It’s very hard to figure out in advance how a story will unfold, but after having written so many novels, I feel more comfortable letting the ideas come up from somewhere in my own subconscious. Writing is much easier now because that sense of panic I used to experience doesn’t set in as I begin a new book. What moves you most in a novel? I’m most moved by very interesting characters. Occasionally, I’ll find a novel that’s so cleverly plotted, it grabs me; but mostly, I want to follow a person in whatever journey he or she is taking, if that character is likable and identifiable. And I try to impart that in my own novels. I always ask myself: how does the crime affect the people involved? If you could re-experience reading one novel as though reading it for the first time, which one would it be? Wow. That’s a tough one. [Laughter]. Leaving my husband’s books aside, and my son Jesse’s, I’ll pick Jane Eyre. It’s a very personal story of a girl who becomes a woman. I’d also say The Count of Monte Cristo, that’s a novel of world adventure and a swashbuckling account of extreme revenge. Both books moved me as a teenager and opened my eyes to a world far beyond my very confined one. What’s coming next from Faye Kellerman? I have my first, standalone novel coming out some time this summer. It’s called The Killing Season and involves a seventeen-year-old boy looking for the murderer of his older sister. Congratulations on writing Bone Box, a superb police procedural with a great deal of warmth and heart. It takes the reader into the world of detective work, forensics, marriage, medicine, murder and mystery.